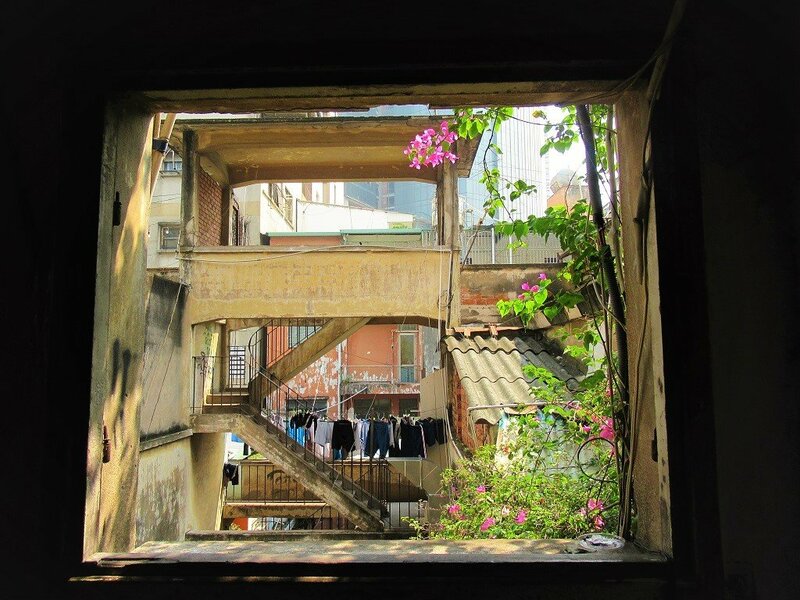 The old apartment block on Ton That Dam Street, in Saigon’s downtown District 1, has been colonized by cool cafes, hipster bars, fashion boutiques, and places to eat. 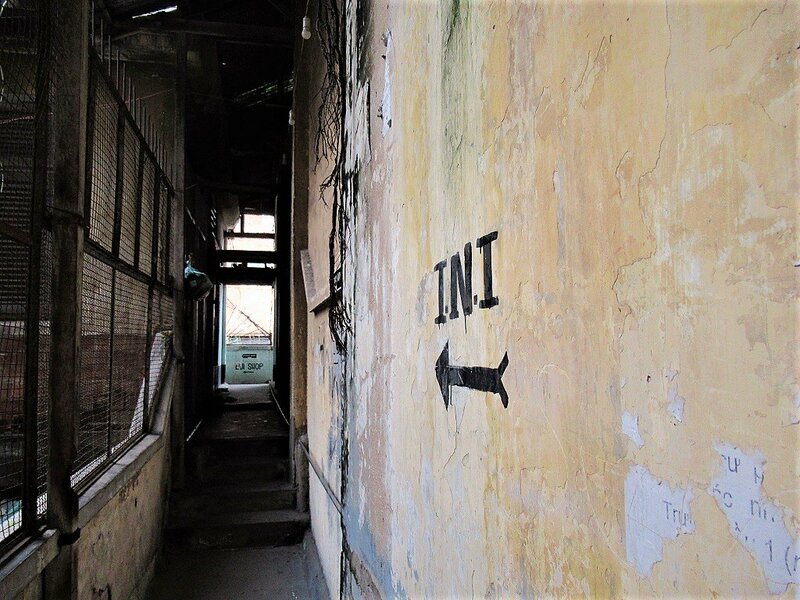 What’s more, gritty and intriguing architectural vestiges lurk in every nook & cranny of this enigmatic French colonial-era complex. 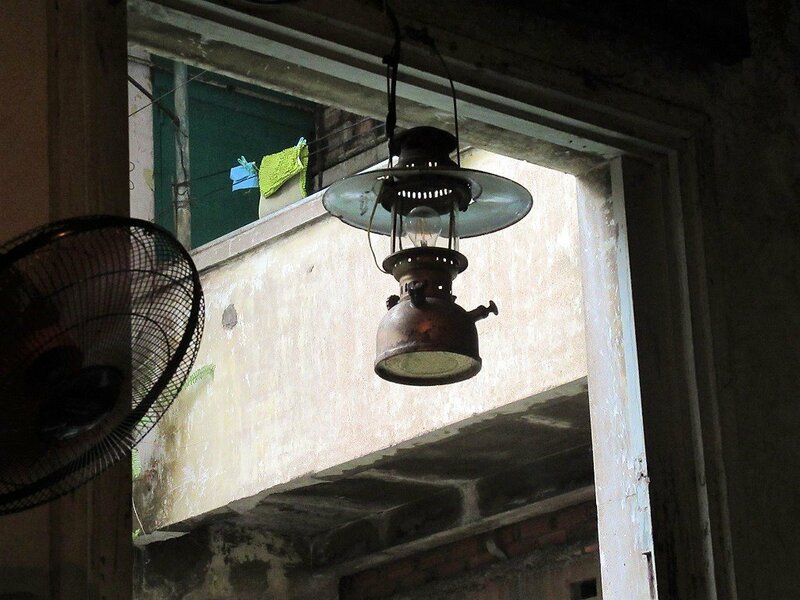 In the midst of rapid urban development, Saigon is losing many of its characterful, old apartments. The irony is that many of these apartment blocks are either vibrant street food zones or have become hip icons of modern, youthful Saigon. Almost nothing else in the city says ‘young, hipster, trendy, and sooo Saigon’ than an old apartment complex riddled with cafes, co-working spaces, boutiques, bars, and restaurants. 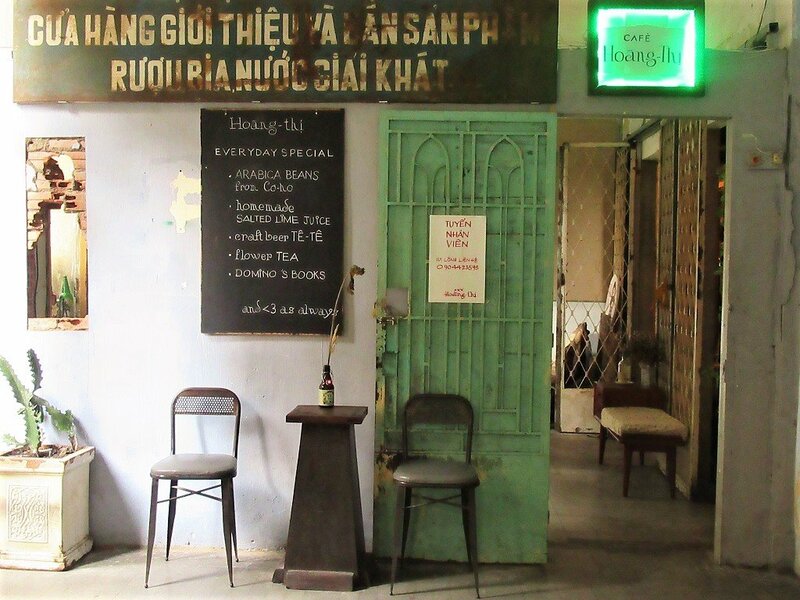 Saigon’s most famous ‘apartment cafe’ is at N°42 Nguyen Hue Street. But the apartment at N°14 Ton That Dam Street (just a 10-minute stroll from its more famous sister) has long been a hip hangout, too. 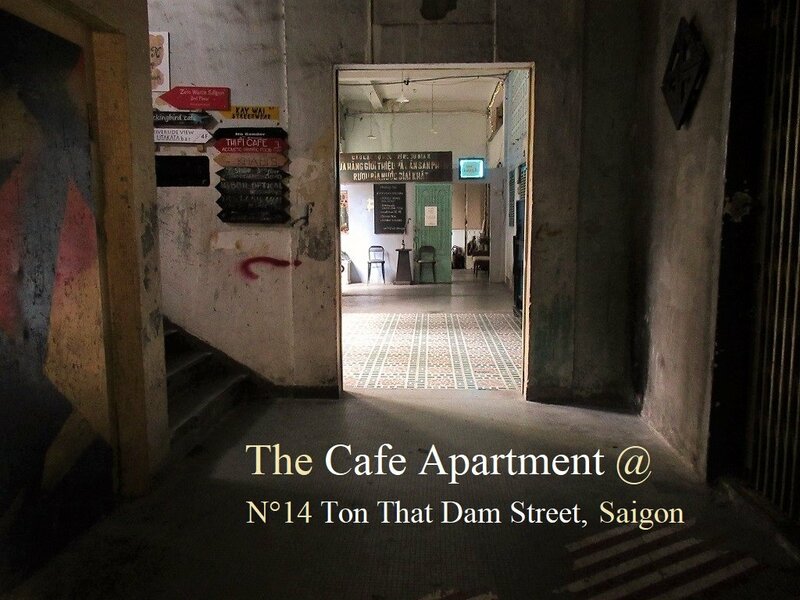 In fact, the Ton That Dam apartment was part of Saigon’s ‘cool scene’ way before the one on Nguyen Hue. The Ton That Dam apartment complex, which by some accounts dates back to the 1860s but with extensive remodeling throughout the 20th century, is a sprawling maze of corridors, exterior stairwells, interior elevator shafts, mezzanine levels, home units, open shopfronts, dark antechambers, and cramped courtyards open to the bright, tropical sunshine. 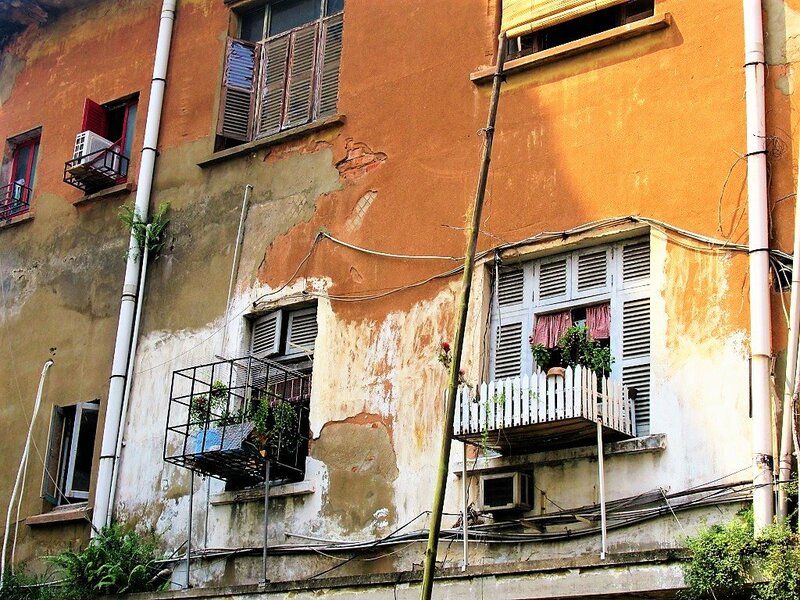 Its walls, floors, and surfaces are a colourful, textural collage of materials: cold concrete, wooden shutters, tiled floors, peeling plaster, exposed brickwork, external piping, whirring air-conditioning units, and nests of electricity cables twisted like jungle vines. This compelling and Instagram-ready structure houses an eclectic mix of cool, chic, elegant, and eccentric cafes, bars and boutiques, some of which would put Berlin or London to shame. As a general rule, expect to pay a premium for most things: after all, this is downtown, hipster Saigon. Here’s a floor-by-floor guide to the N°14 Ton That Dam apartment building. 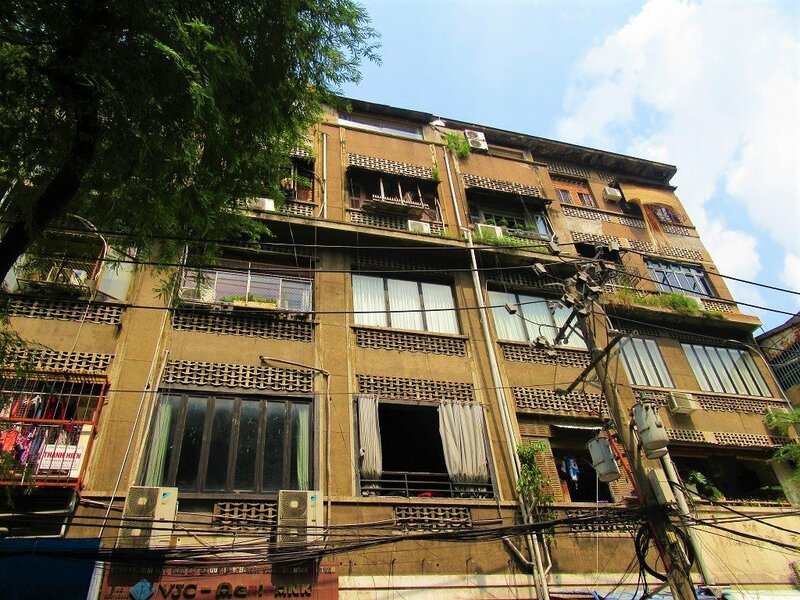 *Note: Saigon’s old apartments are in a constant state of flux: I haven’t listed every business operating out of Ton That Dam in this guide, and some of the details are bound to change. Most of the cafes are open throughout the day; the bars tend to open from the afternoon into the night. Enter the Ton That Dam apartment via an internal alleyway leading under the building, which also serves as the apartment’s motorbike parking lot. (Note: some cafes and bars give customers a ticket to waive the motorbike parking fee: 10,000vnd.) The apartment complex is located directly opposite the overbearing neoclassical facade of the State Bank of Vietnam, formerly the Banque de l’Indochine, in French colonial times. Unlike the Cafe Apartment on Nguyen Hue, the Ton That Dam building isn’t especially striking from the outside. A rather worn and weathered edifice of grey-brown concrete, its neglected condition reveals patches of exposed red brick here and there, like flesh wounds. 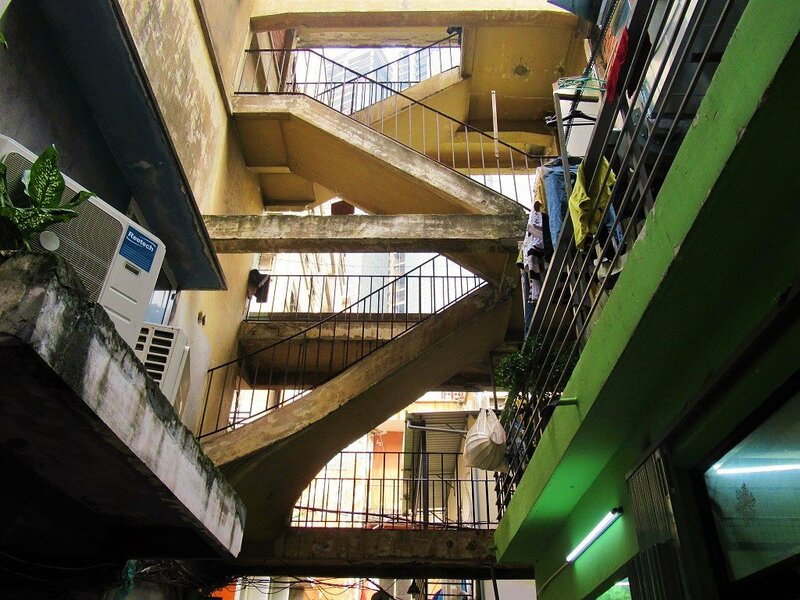 But things change as soon as you enter the complex via the alleyway, which leads all the way through to a back-yard of sorts, over which a multilevel external staircase zig-zags above the courtyard. The complex is a amorphous jumble of architectural styles, from century-old out-buildings to 1950s apartment units and modern renovations. It’s fascinating to observe the different layers of the structure, which reveal themselves as you wander around. On the ground floor, around the parking lot, there are a couple of boutiques, including Jubin Studio fashion store, Duong Le watch shop, and ACOHI craft gift shop, plus a decent vegan restaurant, Mãn Tự, that attracts local businessmen and Buddhist monks alike. But the ground floor is best-known for the views of the external stairwell and access to the all-important main internal staircase, which winds up from parking lot, with a handy list of all the cafes, boutiques, and emporiums posted on the wall. 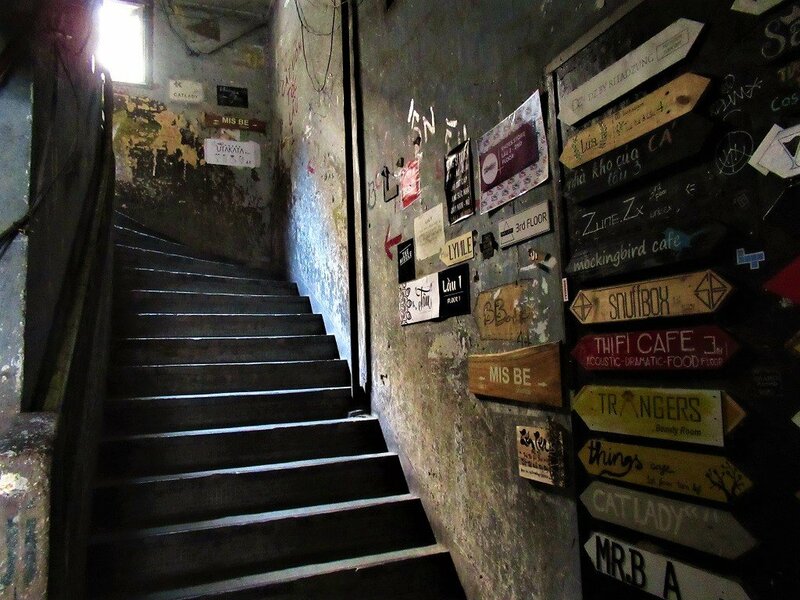 Ascending the dark, atmospheric staircase to the first floor landing, shafts of light beam in through poky, shuttered windows, illuminating tiled floors and crumbling walls, graffitied with the art, logos, and slogans of the bars and cafes that lie ahead. 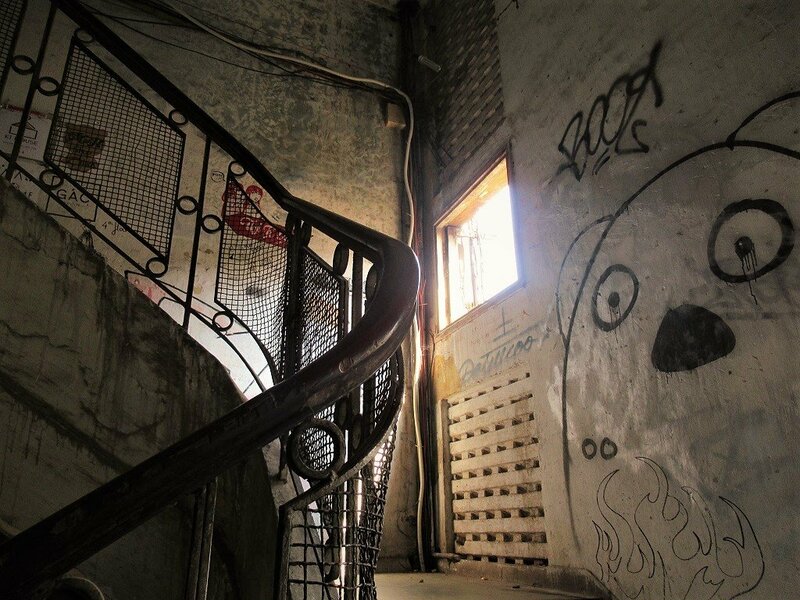 On the first floor, the stairwell widens to provide room for the long-gone elevator system: now just an empty shaft which the staircase curls around, offering a sight line all the way to the top floor. It doesn’t take long to realize that the corners and corridors, the patches of light and shade, of regeneration and decay – almost everything about the Ton That Dam apartment – is perfect ‘camera candy’. Indeed, there’s often a queue of young Vietnamese posing on the stairs for their social media portraits. 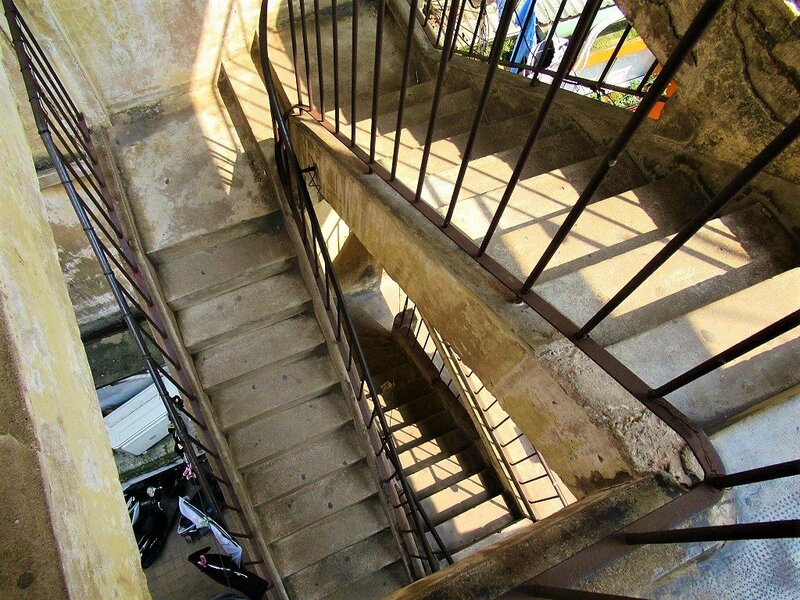 The first floor divides neatly into two halves: right and left of the stairwell. To the right of the stairs there are high-end and second-hand clothing stores, such as Bui Shop, Troy’s, and MIS BE Boutique which, although worth poking your head into, have never enticed me enough to purchase anything. To the left of the stairwell is a superb clutch of trendy ‘vestige’ cafe-bars. 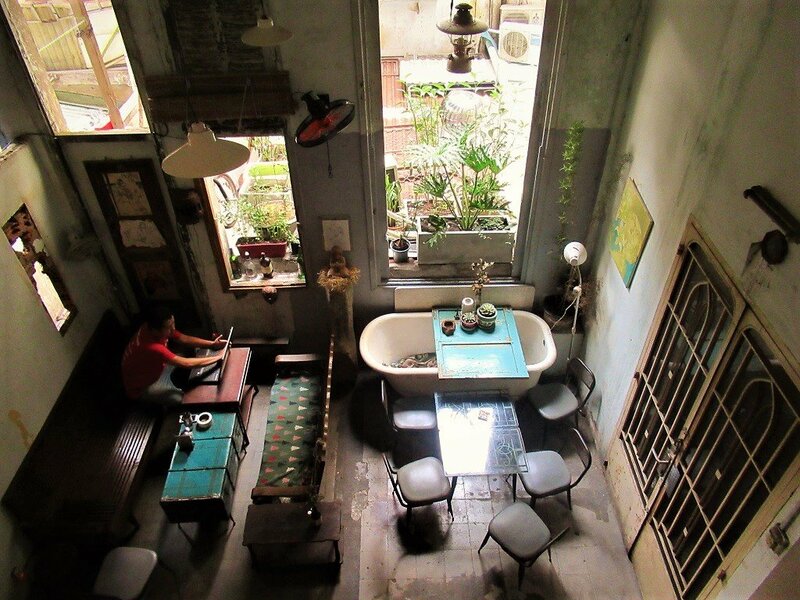 Café Hoang Thi and Things Café are both wonderfully characterful and cool places to be, whether hanging out with friends or using them as digital nomad nests for a day. Café Hoang Thi is a desperately cool homage to old Saigon, with antique wooden furniture, textured stucco walls hung with original artwork, a mezzanine chill-out lounge, hanging lamps, cocktails, teas, juices, craft beer, Italian and Vietnamese coffee, and even a good soundtrack. Things Café has a similarly bohemian feel to it, but it’s quieter, cuter, and more romantic, hence the presence of cuddling couples on sofas. 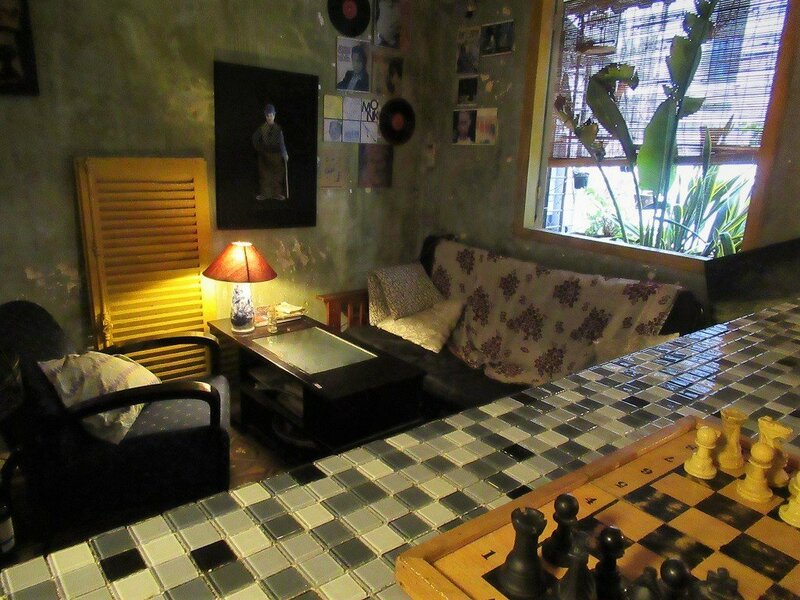 The tiled floors, wooden tables and chairs, creaking ceiling fans, table lamps, chess boards and Murakami books lying around all create a mellow, reflective mood. Perhaps the most well-known of the first floor bars is Snuffbox, located directly opposite the elevator shaft. A concept bar designed around the idea of a 1920s speakeasy drinking hole – which were discreet, secretive places during Prohibition in the United States, when the sale of alcohol was banned – Snuffbox is very stylish and elegant, even if it does feel just a little bit pretentious. Drinks are expensive but very good; decor is perfectly judged. It’s only open in the evenings. What’s particularly nice as you get to the higher floors is that the open-sided corridors get the breeze: the air circulates through the cramped, narrow spaces, and light filters in through hanging plants, decorative railings, and slatted shutters. To the right, as you come up the internal staircase to the second floor, a tight corridor with a tiled floor leads down to Zen Tea. Under the same management as Mãn Tự vegan restaurant on the ground floor, Zen Tea has a mellow, ‘Buddhist’ vibe. With green wooden shutters and green potted plants adorning a cabin-like space with a window onto the street below, it’s a cosy setting. Lots of lovely teas and infusions are available, and the menu operates on a donation bases: there are no set prices. (Note that the Other Person Cafe, the cutesy Japanese anime-themed cafe that used to be at the end of the second floor corridor, is now closed.) At least a couple of units on the second floor are homestay-style apartments. These are very snug, homey little dens, but they’re usually occupied, so the doors are closed. Also on the second floor, the Zero Waste Saigon office is located opposite the landing. This fascinating and admirable project aims to raise awareness of Vietnam’s huge problem of single-use plastic, while offering elegant alternatives to every day plastic use. They’re planning to open a shop here soon. Find out more on their website. Much of the third floor is being converted into chic, short-term rental apartments. Although these will definitely make great Airbnb-style properties, it seems a bit of a shame to me, because they are private, closed spaces, whereas part of what makes the other floors so attractive is the feeling of light and space you get from all the doors and windows being flung open, free for visitors to explore and wander almost at will. But I suppose this is what happens to all trendy locations in any major city. Just like London, where I’m from, creative people, usually young, move in to low-rent buildings or areas and slowly transform them: perhaps opening a couple of bohemian cafes, cheap restaurants, maybe some live musical performances, all of which cater, at first, to their wider circle of friends, but then attract a more diverse clientele. The space becomes hip and cool, driving the prices and prestige up, until the original occupants are forced to move out, and the yuppies move in to what are now high-rent apartments in a trendy part of town. For the time being, there’s a fair amount of renovation in progress on the third floor. There are several trendy fashion stores to the left of the staircase as you ascend to the third floor. A Little Vintage, Kay Wai Streetwear, REDEVI (Retro Denim Vintage) all jostle for space along a dark corridor hung with fairy lights, and bare walls scrawled with murals. But the standout unit on the third floor is Thi Fi Cafe, right on the landing by the stairwell. White-washed brick walls, tiled floors, wooden tables, comfy sofas, fairy lights, a mezzanine seating area, and a window onto the street make Thi Fi a pleasant place to hang for a while with a book or a friend, sipping coffee, tea, or smoothies. In the evenings, acoustic sets are regularly performed by local musicians, making for a good atmosphere. At other times, pretty cheesy Asian pop is played through the speakers. 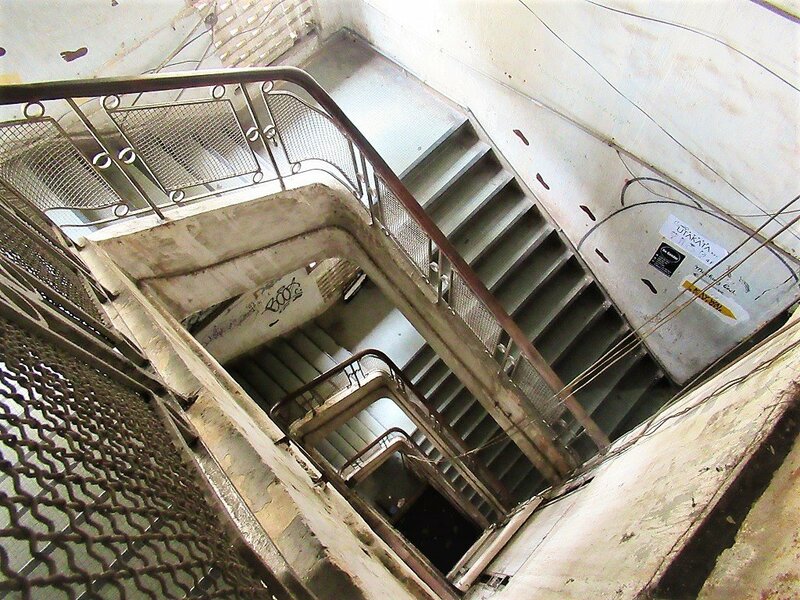 Follow the stairwell all the way up to the top and you’ll reach the fourth floor. From here, there’s a great view back down the empty elevator shaft with the stairway winding all around it to the ground floor. To the left of the landing, Mockingbird Cafe was one of the first places to put the Ton That Dam apartment on the ‘cool map’ of Saigon. Enter through the wooden doorway to a smallish, low-lit space with grey-painted walls decorated with chalk and paper, wooden tables and chairs on cold tiled floors, and lanterns hanging from the ceiling. Collections of empty bottles, dried flowers, fairy lights, and a few brooding fashion snaps plastered here and there, make Mockingbird feel like the dorm of a creative student from Swinging Sixties’ Britain. It has the cosy intimacy of a studio, and the space is just about chaotic enough to feel ‘lived in’. Amy Winehouse and some soulful classics suit Mocking Bird’s cool but mellow space. 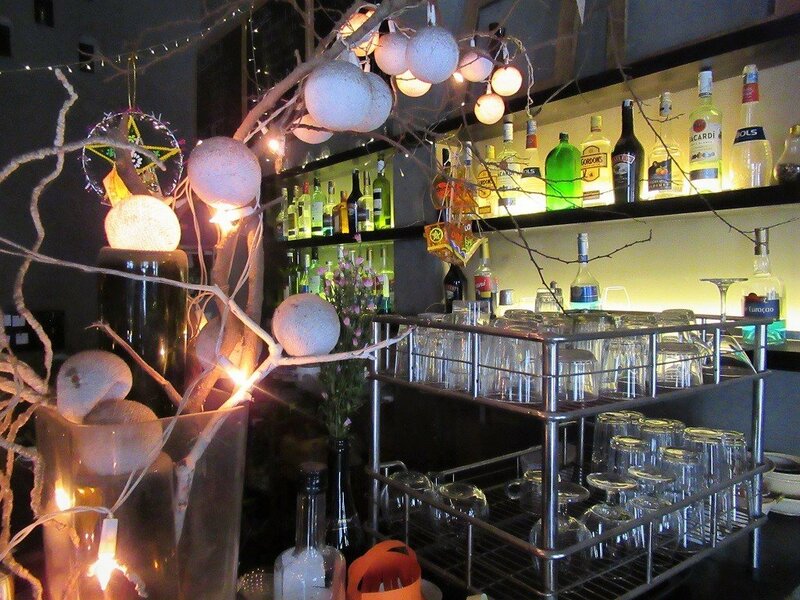 The drink list runs from coffee to cocktails, and the little balcony with fairy lights is a good place to bring a date. Next door, at the end of the corridor, the recently opened Utakata Bar occupies the prime unit of all the apartments in the building: the corner of the top floor, with surrounding windows affording views out over Saigon and the Ben Nghe Channel. It’s a diminutive but classy little place, playing an interesting mix of Japanese pop and Western jazz. 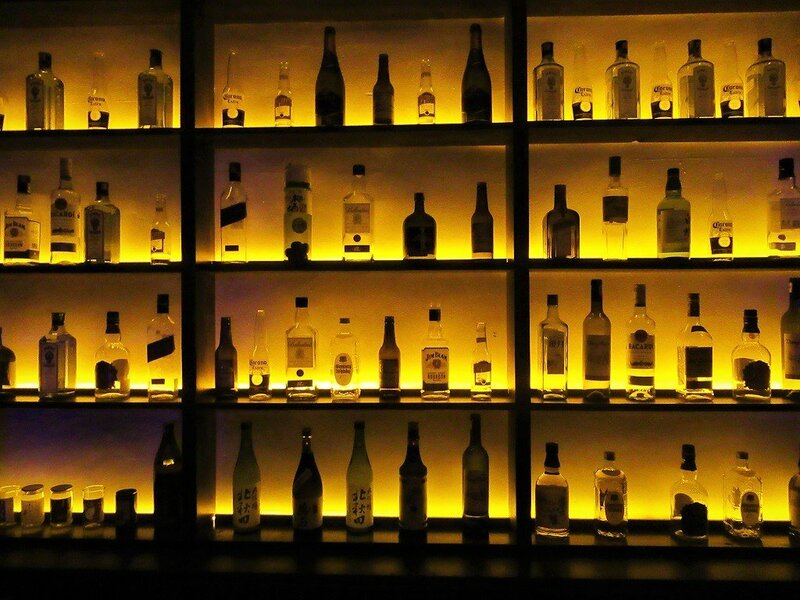 Drinks are fairly pricey (on a par with high-end hotels) but very, very good. There’s a long list of cocktails and Northeast Asian rice and plum wines. It’s open from 6pm until midnight and the perfect way to end an exploration of the Ton That Dam apartment building.